If you’d like to purchase using bank transfer, please email me. Please contact me with any questions about the Chinese Medicine Liberation book, or see this article. 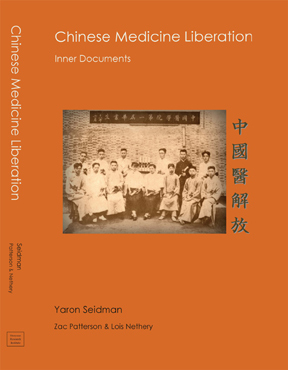 Nov 2015 – see Chinese Medicine Liberation reviewed in the Journal of Chinese Medicine (UK): JCMReviews. If you’re interested in Hunyuan Medicine, please don’t hesitate to get in touch. I’d be happy to answer any questions you may have about studying and practising Hunyuan Medicine, transitioning from TCM, clinical issues, practical issues such as sourcing local herbs and so on. If you’re interested in Jeffrey Yuen’s teachings, as taught by Ann Cecil-Sterman, please feel free to get in touch. Ann and other teachers will be coming to Australia regularly to run seminars and workshops. We sometimes hold study sessions to practice techniques such as sinew channel release or pulse palpation. Interested practitioners are welcome to join in. If you’re looking for a friendly community of Chinese medicine practitioners, a clinic where you can grow your own practice with others available to support you, then please get in touch. At Ocean Acupuncture we have three beautifully-appointed rooms, with Chinese medicine library, HICAPS, virtual reception, linen provided and monthly staff group learning program. If you’re interested in occasional study groups on interesting topics in Chinese medicine, or for knowledge-sharing for CPD then please contact me. If you are in your first year after graduation and a member of AACMA, you are eligible to enter a mentoring relationship with me for up to two years. This is a formal program that is supported as a service to members through AACMA and is free of charge for the mentee. Otherwise, mentoring is available either in person or by distance (phone, Skype, email) at my coaching rates of $180 per hour (ex GST). I can help you to develop your own clinical and professional skills and develop a strong sense of wellbeing in your practice, using a combined approach of Hunyuan Xinfa and Three Principles. These approaches apply synergistically to enable you to discover the root that is at the centre of your professional offering, where giving takes place effortlessly and your patients receive from this wellspring of innovation and insight. Your fertility story – where did you come from, and where are you going?